I just discovered the Foundation for P2P Alternatives wiki, and on the main page they have a really cool quote from Buckminster Fuller, a fascinating thinker that we strangely happened to be talking about tonight after dinner. Throughout his life, Fuller was concerned with the question “Does humanity have a chance to survive lastingly and successfully on planet Earth, and if so, how?” Considering himself an average individual without special monetary means or academic degree, he chose to devote his life to this question, trying to find out what an individual like him could do to improve humanity’s condition that large organizations, governments, or private enterprises inherently could not do. He came up in tonight’s conversation given his tenure at Black Mountain College, one of the truly alternative and progressive educational experiments in the US during the 20th century. It is at Black Mountain College where Fuller met Kenneth Snelson, a relationship that led to the first geodesic dome (one of the inventions Fuller believed would allow humanity to survive successfully on Earth). 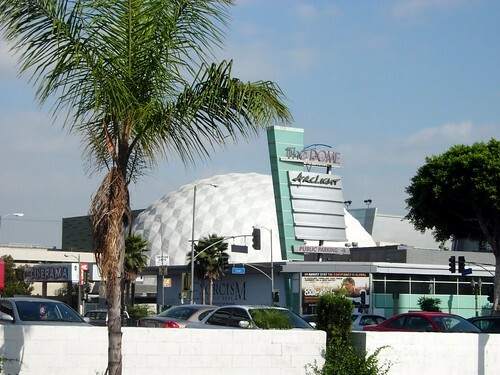 As a tangent, I had one of the greatest movie experiences of my life in a geodesic dome, more specifically the Cinerama Dome watching a 70mm print of Sam Peckinpah’s The Wild Bunch. This entry was posted in change and tagged black mountain college, buckminster fuller, cinerama dome, geodesic domes, kenneth snelson, sam peckinpah, the wild bunch. Bookmark the permalink. Love that first Fuller quote. Now that’ a civil comment, I can apologize twice right? But I think Fuller’s hits something here that you trace well, that futility of fighting a system you don;t really care for as opposed to designing and framing your own, more modest and experimental space that makes the modes of others seem obsolete is an extremely creative approach. The first Fuller quote made me think of paradigm shift. Why does the US have roughly 150 years worth of coal energy reserves? Because when petroleum was discovered to be usable for fuel, it was such an obvious and cheaper improvement that most energy consumers dropped coal like the proverbial hot potato.